Someone dyed a 5-pound dog purple to match her name. It almost killed her. Pinellas County Animal Services posted a warning on its Facebook page of what can happen if someone used human hair dye on a dog. 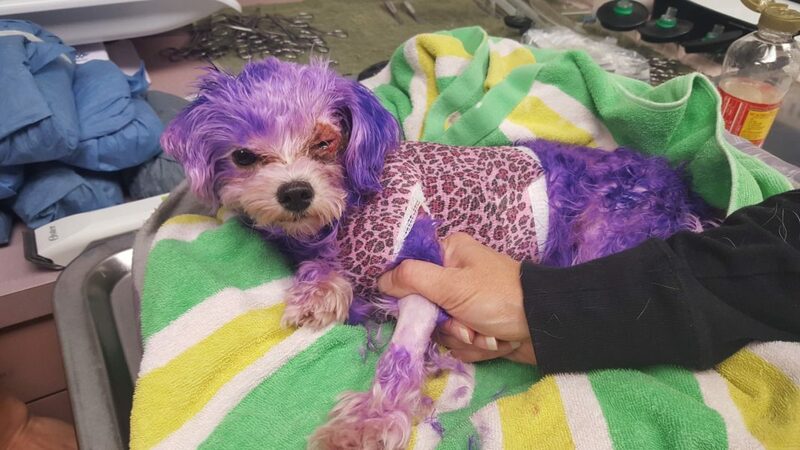 The animal shelter shared the story of Violet, a small Maltese mix that came to the shelter with her fur dyed a purple color. According to the post, the dog’s eyes were swollen shut, she was limp and she had obvious burns to her skin. “Chemicals in hair dye are toxic, causing a wide array of external injury to your pet — possible burns, blindness and because an animal’s first instinct is to lick, it can cause poisoning or internal burns,” the Facebook post warns. She was given fluids and pain medication. The shelter washed off as much of the hair dye as they could. Later, they bandaged Violet up and sent her home with a veterinarian. The Facebook post then explains that all they could do from now is wait. The next step was top shave all of her hair off to asses the damages. When her skin started to slough off, the shelter officials realized it was way worse then they initially thought, the Facebook said. For three months, the shelter waited on Violet day and night so she can regain her strength and get her life back. The Facebook post explains how much the shelter worried about Violet, but then she started acting more like herself. Shelter officials explain she was more alert — walking the halls, demanding everyone give her hugs and kisses — showing that she was getting better. But, when it was time to remove the bandages for the final time, shelter officials were still worried that she was permanently blind or will get an infection, the Facebook post explains. But, that wasn’t the case. The shelter officials say she healed beautifully and her new owner agrees. “So, as you dry up those tears please take one thing away from Violet’s journey — only use products specifically meant for pets, or you could be putting your pet’s life on the line,” the Facebook post said.